The U.S. Courts of Appeals are the most powerful courts in the nation except for the Supreme Court. Some argue they're just as important because the Supreme Court takes up only a tiny fraction of appeals. These 13 courts -- called circuit courts -- wield power over various regions of the country. A ruling at the Eighth Circuit for example, not only decides the law for Minnesota but also North and South Dakota, Iowa, Missouri, Nebraska and Arkansas. If you lose your case in a Minnesota federal court, you can appeal to the Eighth Circuit, which is based in St. Louis. There, you'll only find one woman judge, Diana Murphy. "Since I was appointed in 1994, I never dreamt 14 years later that I'd be the only woman, and there've been nine appointments since then," Murphy said. Murphy said she's used to being the only female on the court because she was the only female district court judge in Minnesota for many years. When she was appointed to the Eighth Circuit, her new colleagues greeted her warmly, but not everyone did. "For many years, the court employed a photographer and there weren't that many of us and they would say, 'Now gentlemen, look up,'" Murphy said. "And it would just put me in a bad mood because you're supposed to smile or look pleasant and I didn't feel like it. You feel many times like you're a sore thumb and they chose to act as though you didn't exist." Outside of the Eighth Circuit, there have been more women appointed to the federal appeals courts. In the Ninth Circuit, which includes California, 13 women have served on that bench. Twelve are still on the court; one resigned to become President Jimmy Carter's Secretary of Education. Murphy is the only female Eighth Circuit judge -- ever. That's a situation Minneapolis attorney Mary Vasaly said is surprising and just plain wrong. Vasaly and three other women attorneys have started a group called the Infinity Project to raise awareness about the lack of women on the federal appeals court. "In Minnesota, we'd gotten to the point where we thought there really wasn't an issue with respect to women being appointed to the bench," Vasaly said. 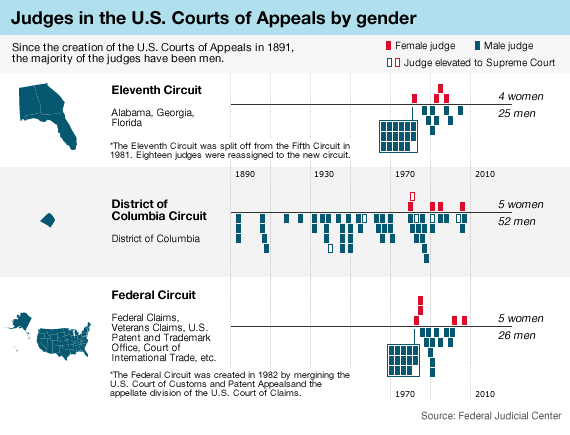 "There are certainly a large number of qualified women to serve and so it became to us kind of a mystery; why is it that the Eighth Circuit doesn't have more women?" Researchers say there are probably many factors at play -- but the biggest one is who's in the White House. Circuit judgeships are so powerful that presidents take a keen interest in choosing them. University of Richmond Law Professor Carl Tobias has studied who gets appointed to federal judgeships for 20 years. He says appointing women and minorities to the federal courts really began in the 1970s with President Jimmy Carter. "[Carter] made it a centerpiece of his domestic policy to seek out and appoint qualified women and minorities. I think that was really the first time that a president emphasized that as part of the president's appointing powers," Tobias said. Carter set up public nominating commissions for all the circuit courts and some district courts to attract women and minority candidates. Anyone could apply and be considered. President Ronald Reagan largely disbanded those commissions even though he appointed the first woman justice to the U.S. Supreme Court, Sandra Day O'Connor. Oregon State University professor Rorie Solberg, who studies judicial appointments including President Bush's appointments, said for there to be real diversity on the federal courts, women need to gain additional seats and not just replace other women on the bench. She said that after President Bush's first term in 2004, 60.1 percent of the federal courts were men. "When he came into office, white men filled 60.9 percent," Solberg said. 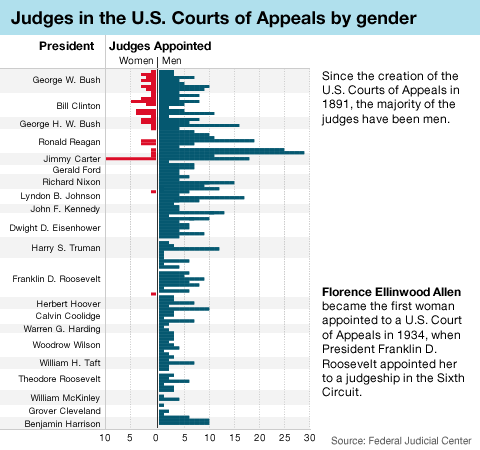 "So regardless of how many women, how many African-Americans or Hispanics he appointed, no one made a lot of headway in changing the overall makeup of the federal bench." Judge Diana Murphy said another reason more women aren't on the courts of appeals is because they don't see it as a possibility. She also thinks that women's groups who pushed for more diversity on the federal bench in the past, stopped pushing. "As women got more traditional appointments, there was less interest in the women's groups to do anything in an organized way because women were getting jobs and it all looked well." Mary Vasaly said the Infinity Project is hoping to restart a movement for more diversity on the Eighth Circuit. "Almost half of the people graduating from law schools are women and that has been the case for quite a long period of time," she said. "And so if you take the top, the cream of the crop as it were, half of those people will be women. And to exclude those, is really doing a disservice to the court." Republican presidential candidate Sen. John McCain has said he will "look for accomplished men and women with a proven record of excellence in the law and a proven commitment to judicial restraint." But he casts his judicial nominees in the likes of Chief Justice John Roberts, Justice Samuel Alito and the late Chief Justice William Rehnquist. A spokesman for Democratic president candidate Sen. Barack Obama said Obama believes the courts should stand up for social and economic justice. Obama has said he wants justices who have the "empathy to recognize what it's like to be a young teenage mom," or to be gay, poor or black.